Thousands of pork pie eaters agree that Andrew Jones makes the best. The Brighouse butcher won the title of champion pie maker in a competition which attracted 51 contestants to the Old Bridge Inn, Ripponden. Mr Jones took over the former Brayshaw's shop in Bethel Street, in August, and also runs a shop in Marsh, Huddersfield. He has a team of eight bakers and also sells thousands of pies weekly through other outlets. And after 24 years in the trade he said a traditional recipe using good quality ingredients is the key to success. 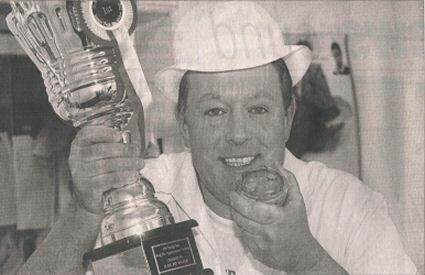 He has won the title three times and is also the national Cornish pasty champion. "Nice, tasty meat, a crusty pie, and well glazed appearance, will keep people buying pies from independent butchers and away from super-markets," he said.